Our dryers are engineered to withstand intensive use, meaning they are protected against overheating due to high traffic. The housing of the appliances is made of robust and durable special plastics. Efficient dust filters protect the sensitive technology on the inside. Public sanitary installations with many visitors benefit from hair dryers with increased hardiness and materials that are resistant to vandalism. Please note that our hair dryers require a voltage between 220-240 Volt / 50 Hz. This is a given in most countries of the world, meaning they can be used in a youth hostel in Italy as well as a hotel in South Africa or resort in Argentina. The indication “delivered without lead wire“ in the product description means that there is no power cable included in the delivery. The cable is provided individually on-site for a permanent flush-mounted installation or connection to a power plug, whatever works best in your environment. If you have any questions about one of our products, go ahead and send us a mail, give us a call or open the chat. The impact a hotel bathroom without hair dryer can have on a customer review about quality and service must not be underestimated. Holidaymakers and travelling salespersons attach a lot of value to the styling of their hair. After all, they want to leave a good impression when strolling along the promenade or at the business meal with (potential) partners. On windy coasts of the Atlantic Ocean, during the skiing and hiking holiday or resorts that are open all-the-year, drying hair outdoors can lead to a serious cold. Due to an average weight of 2kg the installation of the hair dryers on the wall is no problem. The appliance should be mounted at a height of about 150cm above the ground. Blow dryers generally require no maintenance. It is enough to remove dust from the surface of the device with soft and dry cloth. Grease spots can be removed with warm water and a gentle cleaning agent. The nozzles of air inlet and outlet should be kept clean from fluff and/or hair. Blow dryers with a gun-like design have proven to be a good choice in the hotel and hospitality business. The devices come with an elastic spiral cable and look appealing, they easily blend in with the rest of the sophisticated interior. Handheld hair dryers are usually mounted right next to the mirrors where they are within reach at all times. The slim design does not take up much space and is therefore perfectly suitable for small bathrooms. The handle has a good grip. The dryer can be used with the right or left hand while the other one is free to hold a brush or styling tool. If the hair dryer is close to overheating after extended periods of excessive use, an automatic safety device is activated. After about 10 minutes the dryer has cooled down and can be used again. The service life of the electric hair dryers can be prolonged if they are used on the lowest heat setting for a few seconds before they are turned off. Wall-mounted blow dryers with a hose and a nozzle are easy to use. As you can see in the pictures, the hair dryer activates automatically as soon as the nozzle is taken out of the holder. Once the handle is put back into the holder, the dryer shuts off. Particularly children benefit from the simple, intuitive handling. 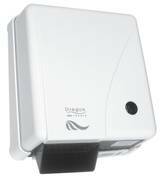 For that reason this type of electric dryer is often applied in the washrooms of public swimming pools and gymnasiums. Continuous operation and oftentimes rough handling are a daily occurrence. We recommend one of our hair dryers with a vandal-proof housing for these environments. The hose extends from 50 to 160cm gives the little ones the chance to dry their own hair. A washable dust filter protects the motor on the inside of the dryer. The protection rating IPX4 indicates a protection against splashing water. If the hair dryer automatically shuts off after about 20 minutes of non-stop use, it is enough to hang up the nozzle in the holder for a couple of seconds. Another extra is the intergrated power socket for electric shavers in the centre of the front side.